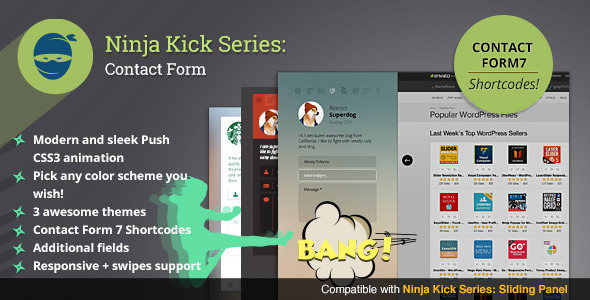 Ninja Kick: WordPress Contact Form is a premium plugin that adds contact form with content push animation effect and clean design on every page of your site. EXAMPLE: You can make menu item ‘Contact Me’ open contact form on the same page impoving user experience. Plugin uses modern CSS3 transitions with fallback to older JS animations if browser lacks support. Form is responsive to screen size changes, works well on mobile devices and reacts on swipe gestures. Please, give a try to how it works and looks on Ninja Kick Form Live Preview. Kick your site! If you’re looking for more universal solution of sliding panel with same off-canvas effect take a look at another plugin from series â Ninja Kick: Sliding Panel for WordPress. You have option to hide label and trigger form opening from any element on page (menu button, link, image). Just add special class ncf_trigger_element to element in your theme HTML editor. Refer to this guide. User-friendly Settings page. Check out screenshot. Contact form adjusts its layout automatically for the best view depending on fields you filled on Settings page. 15 patterned and 15 blurred built-in backgrounds and you can upload and use your own. Swipes support for mobile devices. Localization for languages: English, German, French, Italian, Spanish, Russian, Turkish, Polish. If you have improvements please PM to me your translations. Try out Ninja Form now! Before purchase please check compatibility with your WP theme using bookmarklet from demo page to inject form on your site. There are some conflicts possible with non-standard CSS like heavy usage of fixed and absolute positioned elements, fixed backgrounds or some inline scripts. Current solution fades out all fixed elements when form kicks in. Double check with bookmarklet if you have RTL (right-to-left) direction for text and content on your site. If you found any problem please submit it via message or comment so I can inspect and fix if possible. Grab bookmarklet on demo page in block TRY OUT NINJA FORM. Planned for development: Option to offer to subscribe to your MailChimp email list when user submits form Option to receive HTML version of email Option to generate shortcode to insert Form not only in sidebar Logging messages in database Version 1.7.0 – 1.7.2 (07.04.2014-21.06.2014) - Admin page saves own scrolling state after page reloading (in 1.7.2) - Hotfix for addition info of new fields to email body (in 1.7.1) - Optional fields (Company, Phone, Address, Subject) to add to form - Option on Settings page to insert shortcode generated by Contact Form 7 form-builder - Stylings for each theme to integrate Contact Form 7 - Added localization for Polish language - Replace Vimeo and Dribbble with Instagram and RSS Version 1.6.0 – 1.6.6 (2014-03-28) Minor update Settings page: - Added custom CSS field (saves your CSS during updates) FIXED - Added URL field for custom background - Added test mode (makes form visible only for logged-in admins, useful during setup) - Added field for title of Form emails - Improved compatibility with LayerSlider plugin (in 1.6.2) - Info about page on which form was submitted added to email message (in 1.6.3) Version 1.5.0 (2014-02-05) – 1.5.3 (2014-02-11) - Hotfix for broken email sending (in 1.5.3) - Added compatibility with LayerSlider (in 1.5.2) - Added more space for form on small screens (in 1.5.1) - When you choose to hide label it now appears when form is exposed to show user exit (in 1.5.1) - Added compatibility with future plugins - Fixed bug in IE8 Version 1.4 (2014-02-04) - Drastically improved animation performance in Chrome on Windows Version 1.3.1 (2014-02-01) - Fix for easing function in older browsers Version 1.3 (2014-02-01) - Added third theme â Aerial, my personal new favorite - Freezing main content scroll when Form is exposed - Focus in first input when exposed - Added option to hide social bar Version 1.2 (2014-01-26) - More label options (hidden label fades in when specific element scrolls into view) - Improved compatibility with fixed elements on page - Changed responsive scaling for smaller screens to make form more visible - Added sender IP info to message body you receive to ban spammers - Clearer way to close form - Added message sending animation while AJAX making request Version 1.1.1 (2014-01-21) - Added localization for next languages: + German + French + Italian + Spanish + Russian + Turkish - Fixed uploaded images automatic resize logic Version 1.0 (2014-01-18) - Plugin is approved on CodeCanyon Please leave your feedback on comments page, I’m interested to improve the product with focus on clients’ satisfaction. If you have issues please send message via contact form I’ll try to update/fix as soon as possible. You may also like Superfly â Responsive WordPress Menu Plugin.